During the 1950s and 1960s, the British government conducted a series of nuclear tests within the borders of its faithful ally, Australia. The mainland atomic tests and the subsequent extensive and dangerous 'minor trials' were held at Maralinga, in the South Australian desert. At the time, many Aboriginal people in the SA bush had the logical thought: 'Must be a war on again ... an enemy has come.' What a surprise to find out that the bombs, starting with the 'Black Mist' bomb of 15 October 1956 at the Emu site northwest of Coober Pedy, were detonated by an ally! Britain had simply asked a willing Australian prime minister, Menzies. Even after the consternation of finding the Milpuddie family asleep in the Marcoo bomb crater, the British scientist Professor Titterton assured the Australian public that 'no harm was caused to anyone'. Unsurprisingly, the 1984–1985 royal commission into the British nuclear tests heard much evidence to the contrary from Aboriginal witnesses, including Mrs Milpuddie. Having lived in both Coober Pedy and Yalata (to where the Traditional Owners of the Maralinga lands were moved in 1952), I've heard from Aboriginal people many stories and seen some of the serious repercussions myself. As well, non-Aboriginal service and other personnel have had decades of fruitless campaigning for compensation. 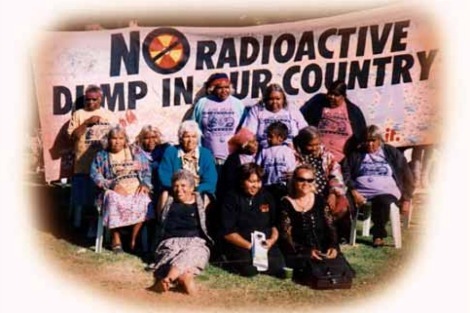 Personal traumatic experience of these nuclear tests was the driving force behind the leadership of Kupa Piti Kungka Tjuta (KPKT) — Senior Aboriginal Women of Coober Pedy — during what became a six-year-long national campaign (1998 to 2004) against the national radioactive dump proposed by the federal government for the northern South Australian bush. South Australia, seen as a politically weak state, proved a formidable foe, with the KPKT and environmentalists teaming to protect country, groundwaters, and present and future generations of South Australians. Huge grassroots campaigns, media support and a newly elected SA Labor government under Premier Mike Rann took up the fight. With 86 per cent of South Australians opposed to the national proposal and a federal election on the horizon, key federal MPs from SA persuaded Prime Minister Howard to abandon the plans. Senator Nick Minchin gave 'a rolled gold assurance' that SA would never again be targeted as the site for the dump. Fast forward to early 2015 and, to the absolute astonishment of those of us involved in the previous campaign, Premier Jay Weatherill announced that a royal commission would be held to consider the feasibility and viability as well as the risks and opportunities associated with four areas of the nuclear fuel cycle, including storage of radioactive waste. Commission questions 4.3 and 4.4 actually canvased the possibility of SA welcoming the world's high-level radioactive waste! The world's only functional depository for high-level radioactive waste (New Mexico, USA) has been closed for the past four years. A nuclear industry, faced with falling prices and post-Fukushima growing concerns about the dangers of the nuclear industry, is looking around for new possibilities. Yes, everything is connected. The budget for the 2015 Indigenous Advancement Strategy budget funded SA Aboriginal communities less than ten per cent of what they required, and some received nothing at all. So it's a very relevant concern that some communities might be enticed to offer themselves as a site, not only for a national dump for intermediate and low-level waste, but for a depository for the world's high-level radioactive waste, which remains radioactive for a minimum 100,000 years. This is a justice issue for the members of those communities that might be affected. But the implications are much broader. High-level radioactive waste fallout from transport accidents will be no respecter of state boundaries. This issue affects us all. 'Our goal [is] to become painfully aware, to dare to turn what is happening to our world into our own personal suffering and thus to discover what each of us can do about it,' writes Pope Francis. Kevin Buzzacott, an Arabunna Elder and long-time campaigner against the uranium industry (which draws 29 million litres per day from the ancient waters of the Great Artesian Basin on his lands), puts it another way way: 'If we look after this old country, the country will look after us ... How could I cut off my knee or part of my knee? I won't work without parts of me. Same for country. 'If we look after this old country, the country will look after us ... How could I cut off my knee or part of my knee? I won't work without parts of me. Same for country." This sounds all very deep and meaningful. But, with all due respect, what exactly does it mean, and why should it be held up as the last word? Does it mean we should abandon mining, landscaping, building and agriculture, because it's not "looking after this old country"? If we applied this principle, then far from "looking after us" the old country would certainly leave 23 million Australians in dire poverty, if not just plain dead - and not before they had killed and eaten every other living thing in a desperate final bid to live. Moreover, "funding" for aboriginal and other communities comes from the stock of wealth created by the very activities of mining, farming, and industries which build on these. Our nation's wealth doesn't just grow on trees, even in old country! For the sake of the aboriginal people and all Australians, I say, enough of this dangerous, woolly romanticism, which is so closed-minded it won't even consider an inquiry into the feasibility of something. The 23 million people of whom you speak are living on stolen land. Funding Aboriginal communities and services at liveable levels is just paying the rent. Aboriginal people are 2% of the current population. I am far happier with my taxes being used to support Aboriginal people living on country than I am for it to be spent on fighting other people's wars. Nuclear energy needs to be a larger part of the electricity-generating mix in a cleaner low-carbon world. When are the greenies going to get this? This should be a great opportunity for economic sustainability SA, including for its Aboriginal populations. The idea that somehow aboriginal people lived in Australia for tens of thousands of years (which they have) without inevitably imprinting (negative) human activity on the land is nonsense of course; think burning and hunting and its major consequences for what we see today. Oh, HH! What kind of 'dangerous, woolly romanticism' leads anyone to believe there might be anything at all feasible about leaving the burden of caring for high level, toxic, radioactive waste to our children's children? How can we delude ourselves that such waste would not harm the earth? The radioactive racism continues. Excellent article. Bravo Sister! Renewable energy, whether solar, hydro or wind powered are safer for our health, cleaner for the environment, and cheaper in the long term. Africa has thousands of acres of solar power, banks are not funding money-losing coal and everyone knows how dangerous nuclear energy is! Radioactive water from the Japanese disaster is spilling into the Pacific every day and Japanese people are buying Australian properties. The highly dangerous uranium waste has caused cancers and birth defects wherever the first world countries have dumped it in third world communities - those who are too poor to protest or even have any political rights to do so! Let the Australian millionaires, especially those one in five who pay no tax at all, and people like HH and Eugene, (Shame!) volunteer to have radioactive waste dumped in their own back yards. When Aboriginal communities are given nothing, or less than 10% of what they need and it is debated whether wealthy families need taxpayers' money to hire nannies, we have a government without conscience. The Adani coal mines left a thriving fishing village with a treeless bog and no fish. When the country dies so do we, HH! Shame on you! Thank you, Michele, for bringing this message to the wider public. You have my prayerful support. Three reasons why we should look long and hard at stockpiling nuclear waste, Mother P: 1. For starters, radioactive waste is a by-product of nuclear medicine. No radioactive waste = no nuclear medicine, so more deaths and sickness as a result. 2. A cool-headed look at human history shows that as technology develops, more avenues for solving problems associated with all human activity are opened up. Case in point: e-cigarettes will slash levels of lung cancer. It is entirely feasible that within a century or two (if not less) new technology will arrive which enables us to completely recycle/reprocess our radioactive waste stockpiles as nuclear fuel, or dispose of it by sending it into the mantle via subduction zones, or safely launch it into the sun, etc. 3. Radioactive waste can and has been transported and stored safely for decades. Since the birth of the nuclear industry, there have been very few accidents worldwide involving radioactive waste, and, to my knowledge, none involving loss of life. Rann's obstruction of a purpose built repository in SA caused much of Australia's radioactive waste inventory to remain stored at Woomera. Hardly a triumph for SA or KPKT. if radioactive wastes and their long storage are some sort of solution, why not bury them in Toorak or Hunters Hill or Unley? why not spread the wealth around? HH - Yes! God's gift of human intelligence may well result in new discoveries about how to handle uranium safely at every stage of its production in the future; who can deny it? Let's leave it where it is - in the ground - until then. Children who play with fire get their fingers burned: we are babes in the science of caring compassionately with each other, babes in the science of caring for our Sister, Mother Earth. Uranium is, so far, beyond our capabilities to harness safely to answer human need/greed. Just to clarify, Mother P: so, no more nuclear medicine, then? No more X rays and nuclear medical imaging? No more radiation therapy? No more nuclear pharmaceutical products? Just leave all that radioactive stuff in Mother Earth and let people suffer and die? And no more x-ray astronomy, not to speak of the myriad of other uses in science? And finally, if one is perturbed by a prospect of dangerous anthropogenic global warming (I'm not), the forsaking of the only serious contender for providing global base load power outside fossil fuels? BTW, we've known how to handle radioactive products safely for several decades. It can be surprising to learn how much they are a part of everyday life, with no damage whatsoever. On the other hand, we haven't solved the problem of wind turbines massacring bird and bat populations while Mother Earth weeps. But I welcome your response ... it's important to discuss these serious issues respectfully. Thanks to respondents. A brief article is only an outline but perhaps I could make it clear that Mr Buzzacott is speaking about uranium mining. Uranium seems to be one substance that we can so well do without. The pro-uranium lobby makes much of the medical necessity but cyclotrones powered by electricity produce radio isotopes which do the same job in medicine without necessitating radioactive waste. The waste stored in Woomera is low level radioactive waste – of no comparision to the importation and storage of international high level /long lived intermediate waste which is seriously being considered. There was an accident recently in Port Adelaide. Though the yellowcake is of much lower radioactivity, the package still had to be returned to Olympic Dam to be handled. Post Fukushima, we know large and smaller accidents will always happen. KPKT, always concerned about groundwater contamination and the future generations, constantly puzzled,’ Don’t whitefellas have grandchildren?’ There is a way?forward. Clean, no long-term-waste alternative energies already supply 40% of SA’s energy needs. Dr. Mark Diesendorf’s (University of NSW) 2015 report shows that?South Australia could be run on 100% renewable energy by 2030. We just need the political will. This is a travesty and is continuing still in Ceduna. Aboriginal rights are just trodden on everywhere. HH, we need respect and learn from Aboriginals. Elders have the knowledge of local lands and must have a right to decide what happens in their backyard. Your assumption about mining royalties is incorrect. E.g since 2006 (in the NT) the ABA has been controlled by the Minister of Indigenous Affairs, who has the ultimate say! The Federal Govt. in 2006,without the consent of Aboriginals, took control and their money since been [mis]used according to Govt priorities and flawed ideologies. A&TSIs are calling for basic rights, long denied them- to self-determination, equality and the right to control their lives and lands through treaty/ies. Dispossession and destruction have continued since colonisation .To understand a little more watch 8 minute video https://www.youtube.com/watch?v=nU_H0oIQy60 Like-polices are rolling out across Australia & Aboriginals being stripped of basic human rights. Current plans in SA are intend on further assimilation & dispossession. Aboriginal people must have a direct say about their lives & lands from ‘the outset of policy formation’. Currently they are all but excluded from any "fair negotiations" despite the rhetoric one hears. Re Mining e.g.-look at this recent disaster playing out in the NT, "Poison or Poverty? Glencore’s Blackmail of Borroloola" at http://theleap.thischangeseverything.org/poison-or-poverty-glencores-blackmail-of-borroloola/ Mining at what cost! The wealth FEW have gained has not come off trees! Aboriginal people seeking now to heal environmental damage caused. Georgina, I've made a few points above. None of them implied that aborigines shouldn't have full control over their lands or shouldn't be paid just royalties for mining. I'm questioning above the rationale behind decisions on certain issues, not the in principle rights of land owners to make those make decisions. But if we must open up the discussion, let's not kid ourselves: there are also huge problems associated with the relationship between designated aboriginal governing bodies and their communities. The Groote Eylandt scandal - a whopping $36 million disappearing from the trust fund in 2 years - is only the latest of a litany of corruption stories. It underlines that we shouldn't automatically assume a convergence of interests between the individual members of remote aboriginal communities and those appointed as their leaders. Once again, as I said, woolly romanticism is a dangerous philosophy.